The M11's Steam-Flush Pressure-Pulse Air Removal System is so efficient that it can pass the air removal tests required on more complex vacuum steam autoclave systems, thus ensuring good steam penetration for those challenging loads. Plus, less complexity means better reliability and a cost effective solution for your sterilization needs. Once the sterilization is complete, the door of the autoclave opens automatically and quietly to dissipate steam and dry your instruments. You'll have dry, sterile instruments every time. If the door is not closed completely or the reservoir water level is low, the LCD display will provide the appropriate message. In either case, sterilization will not continue until you've attended to the unit. For ease of draining and filling, the M11's reservoir fill port and drain tube are in the front of the unit, not on top or in back. 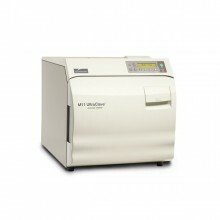 The M11 printer accessory provides a permanent record of cycle times, temperatures and pressures during a cycle. Programmable controls allow for creation of different cycle parameters for special sterilization needs. Programmable buttons allow you to change the following: Exposure Time (3 to 90 minutes), Temperature (230 to 275º F), Dry Time (0 to 60 minutes), or Vent (slow or fast). The #1 and #2 buttons allow you to store the change if desired. Four pre-programmed sterilization cycle controls: Unwrapped (132º C or 270º F for 3 minutes), Pouches (132º C or 270º F for 5 minutes), Packs (121º C or 250º F for 30 minutes), Handpieces (unwrapped and pouched) (132º C or 270º F for 6 minutes). 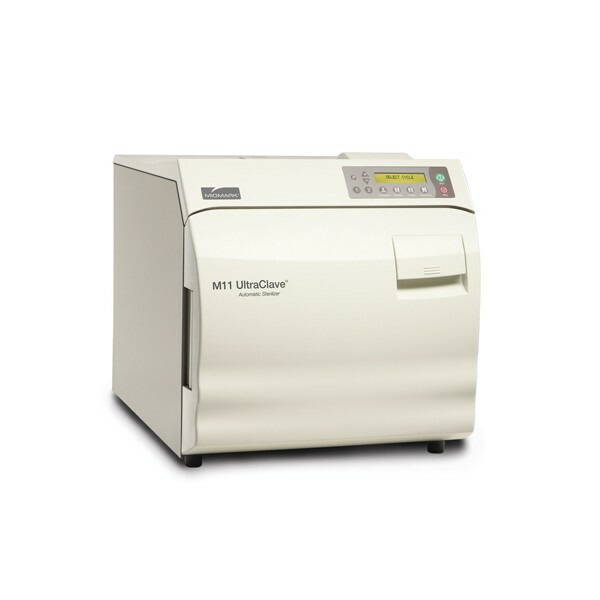 Click the button below to add the Midmark Ritter M11 UltraClave Automatic Sterilizer to your wish list.